We, Hotel Mount Simvo (A group of Hotel in Sikkim ) would like to introduce ourselves as a 'Natures Blessed Paradise' with Nature Mystique and eternity, a haven of cool air, mist and occasional snowier, with lush green city and breathtaking Himalayas, where peace and tranquility is synonymous. Our Hotel is situated in natures lap at Gangtok (The Capital of Sikkim), a hidden paradise in the state of Gods own Country; this absolute natural leisure hotel is a vacationer’s ecstasy. Spread over 7096 sq km, it enfolds the upper valley of the Teesta River. Its Southern borders with West Bengal are shared with the Rangit and Rangpo Rivers; the Singhalila Range acts as a nature barrier with Nepal in the west and the Dongkhya Range runs along the borders from the north to the north east. This land of intense natural beauty, imbued with mystic aura, is steeped in legends and history. The profusion of lofty peaks, holy lakes, ancient monasteries, orchid nurseries. Hali-Tours and stunning trekking routes makes Sikkim a multidimensional holiday destination. Laundry Facilities, Currency Exchange, Breakfast Services, Parking, Airport Transportation, Security Guard, Room Service, Backup Generator, Doctor on Call, Travel Counter. Wakeup Calls, House Keeping, Attached Bathroom, DVD Player, H/C Water, Cable/Satellite TV, Iron/Ironing Board, Toothbrush/Razor on Request, Air Conditioning Room. 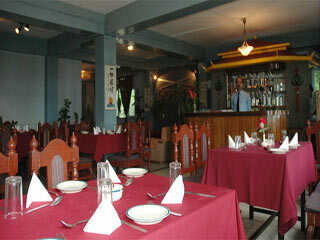 User reviews for "Mount Simvo Hotel Gangtok"